Oh sure, it was 39 degrees on Fremont Street during the show. And for most hosts, that would be a show-stopper. But did Jeff want to stop the show? 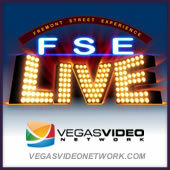 On this episode of FSE LIVE, we broadcast from the upstairs patio of the Golden Nugget’s Gold Digger Lounge and have a drink with the property’s VP of Marketing/Advertising Amy Chasey.